Here's the thing about going to the gym: it can improve your physical health. Provide greater emotional well-being. Maybe even make you look good shirtless and/or in a bikini. All it takes is hard work, the eye of the tiger, an unflagging commitment to becoming harder, better, faster and stronger, and an inner reservoir of interpersonal patience and tolerance to shame Gandhi. In fact, it mostly takes the latter. Because at the gym, as in life, hell is -- thanks, Sartre! -- other people. No right-thinking general would send troops into battle without a map. No football coach would send players onto a field without a scouting report. And yet, every January, millions of unsuspecting Americans follow LaLanne's example and join health clubs -- without so much as a warning about the annoying, archetypal individuals who lurk within. Signature behavior: Appearing to be finished with his or her turn at a piece of exercise equipment when, in fact, he/she has approximately 47 sets and/or descending hills remaining. Distinctive markings: A vacant, murderously intense or just plain oblivious 1,000-yard stare into the vast, imponderable middle distance that lies somewhere between you and the water fountain; earbuds. Natural enemies: Everyone else who also would like to use the squat rack before his or her two-year gym membership expires. Mating call: A long, mournful, exasperated sigh containing the passive-aggressive fury of 1,000 suns, delivered like skunk spray in response to outside aggression such as "How many sets do you have left?" and "Mind if I work in?" Give Campers credit: They don't actually bring temporary frames, plastic tarp and portable propane stoves into the exercise area. No, their base-camp-establishing tool of choice is the humble white towel. Towels over the Olympic bar. Towels across the bench. Towels hanging from each side of the treadmill. The towels are a combination of Sir Edmund Hillary preparing to scale Everest and a dog marking its neighborhood territory: I'm here. This might take a while. The Camper pumps out a set of cable flys. Followed by a set of reverse cable flys. Followed by a set of torso twists. And that's just his warm-up. 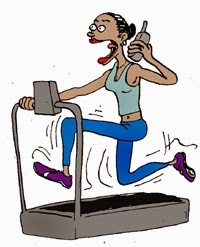 … She presses pause on the elliptical machine -- not to stop, but to switch from a 45-minute hill climb to 30 minutes of interval training. The Camper does not stretch. Or get water. Or move, for that matter -- not until his or her own private workout is done, no matter how (a) much you're paying for your stupid membership; (b) pressed for time you are, given that you're on your lunch break; (c) forcefully you place your hands on your hips and shoot him a thoroughly annoyed look. Although the Camper's unawareness seems to indicate a parental failure to teach rudimentary sandbox sharing and/or a cognitive delusion that a public fitness facility is actually one's garage gym, recent scientific research indicates that Campers might simply possess a regressive optic gene that blinds them to other gym-goers and signs reading 30-MINUTE LIMIT. Signature behavior: Noticing that your knee is bending beyond your toes, your elbows are dipping below 90 degrees and -- basically, you're doing everything all wrong. Not that you were wondering, of course. Distinctive markings: Neither particularly fit nor sweaty; does not wear a name tag or health club-branded moisture-wicking shirt; come to think of it, lacks all outward indicators of physical competence and credibility. 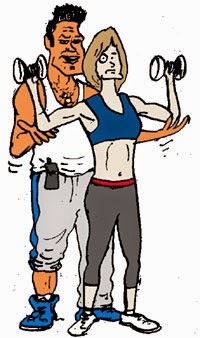 Natural enemies: Anyone working with an actual personal trainer; everyone wearing earbuds. Mating call: "Hey, do you need a spot?" The Personal Non-Trainer seems friendly enough: an offer of a spot, a kind word about the amount of weight you're lifting, a curious query about where you got those cool running shoes. Don't be fooled. If you encourage additional conversation -- or, worse yet, pause your music -- you'll be stuck with the fitness coach you never knew you wanted, and with good reason because if you did want one, you'd shell out hard-earned cash for the genuine, trained-and-certified article. Or at least someone with a name tag. Although the Personal Non-Trainer knows a little something about getting buff -- that is, we assume; he does have a subscription to "Men's Health" and probably even reads it -- he mostly comes across as the living embodiment of the saying that "those who can't do, teach." The Personal Non-Trainer will teach you to add an unnecessary, possibly harmful squeeze at the top of your lift. (Activate all the muscle fibers!) He will teach you that your diet is all wrong. (Nobody eats carbs anymore! You need a lemon juice-and-paprika cleanse!) Mostly, he'll leave you confused, bogged down in yammering about super-sets and thinking about your running stride instead of, you know, working out. Ask him why he isn't reaping the awe-inspiring rewards of his foolproof fitness tips? He'll mention something about a torn rotator cuff. Worst of all are the Personal Non-Trainer's efforts to spot. The gym is a place for forgetting, a stress reliever, an escape into your own body and away from the hell of e-mail and office politics and other people, only here's some dude standing six inches from your face, unwittingly making your lift unbalanced, exhorting you like John Lott at the NFL combine, and all you're left with is a single thought: Seriously, who the heck asked you? Signature behavior: Making you feel bad about yourself, through either (a) envy or (b) osmosis. Distinctive markings: On her: bobbing ponytail, sports bra, form-fitting shorts and/or yoga pants made from the same light-refracting, radar-absorbing composite used to skin Stealth bombers. Did we mention the ponytail? 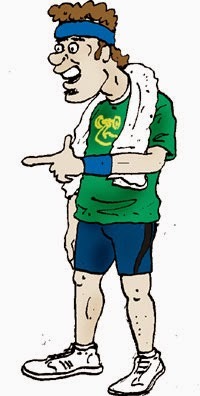 On him: threadbare old T-shirt, canvas shorts, black and/or argyle socks that go to midcalf. The fitness equivalent of the theater world's happy/sad, comedy/tragedy masks, Ms. Awesome and Mr. Uninspired are less a study in contrasts than the diametric poles of going to the gym. She teaches an aerobics class. 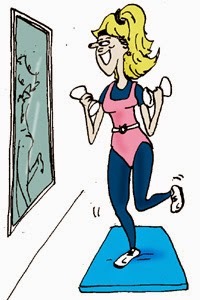 And cardio-kickboxing. And spinning. And 15-minute abs blast. (Not that she needs it.) All on the same night. Although she's never been spotted with coffee -- or any sort of energy enhancer, except for a suspiciously high-tech, supplement-company-branded water bottle that isn't available in stores -- she's never, ever tired. Or even very sweaty. Not when she's yelling at encouraging you to power through another set of 15 (read: 25) squat lunges. Not when she's subsequently chatting with her soaked, winded, exhausted students. Not when she then hits the exercise floor for her personal workout, her triceps pushdown form so flawless, so exaggeratedly perfect, you'd swear she was posing for a magazine cover shoot. (Actually, that was last week, and it was for a kettlebell/Swiss ball routine.) Indeed, Ms. Awesome used to work as a fitness model more regularly until it interfered too much with her goal of completing triathlons in all 50 U.S. states, as well as Puerto Rico and the Virgin Islands. By day, Ms. Awesome works as an investment banker and is starting her own cupcake bakery on the side. In your heart, you will try very, very hard not to resent her. But you will fail. Mr. Uninspired, on the other hand, radiates the positive vibes and boundless, crackling energy of Droopy Dog. Because of his appearance, Mr. Uninspired is often confused with the Hapless Hotel Guest Who Forgot His Workout Clothes; because of his activity, he is easily mistaken for the Guy Who Never Actually Touches Anything and Appears to Be on Walkabout. In reality, Mr. Uninspired wants to work. Only not too hard. A biceps curl here (fifteen-pound maximum.) A treadmill jog there (aka: the warm-up portion of the pre-programmed course.) A copious amount of water drinking and towel-to-forehead wiping, never mind that watching closed-captioned CNN while standing kinda sorta near the decline press rack isn't exactly T.E. Lawrence crossing the Nefud Desert. Should Mr. Uninspired end up on the rowing machine next to yours, you'll want to slow down, give up and quit early; should he end up on the adjacent curl machine, you might have visions of placing your skull between the plates. Such is the contagious nature of his torpor. Of course, Mr. Uninspired flitters like a hummingbird from faux crunches to bogus sessions on the heavy bag, making him inescapable, a walking reminder of John Wooden's warning to "never confuse activity with accomplishment." Mr. Uninspired has never heard of John Wooden. Signature behavior: Moving lips; emitting sounds that are unrelated to both the theory and practice of exercise; squinting at/tapping on portable electronic device. Distinctive markings: Dry clothing; drier mouth. Natural enemies: Anyone profoundly unconcerned about (a) Tom Brady's passing proficiency and leadership qualities and their effects on a football game that will be played four days from now; (b) whatever it is you do for work at your office, and why it's so important that you are still doing it at the gym; (c) that cute guy who said he would call back, then he didn't, for like weeks, and last night you ran into him at a friend's party, and he was acting like nothing happened, only you're really tired of playing games, so is he gonna call this time or what? Mating call: Specific to individual; measured in volume, both auditory and word count. 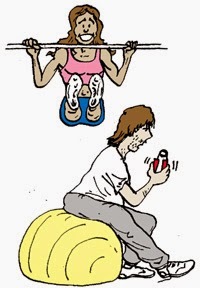 The Yakker does not need a personal trainer and a bench. He needs a therapist and a comfy couch. The Yakker doesn't need a running partner, either. She needs a mug of steaming Taster's Choice house blend and two treadmills that face each other. Because the Yakker talks. And talks. Yammers through sets. Gabs during class. Simply will not shut up. Ever. Not when her trainer is giving important instructions. Not when he has 200-plus pounds of rubber-coated, diaphragm-crushing iron an inch from his chest. No chance. 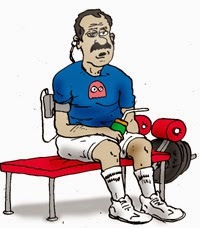 After all, the Yakker came to work out -- to work out his or her issues, interests and general life outside the gym, whether or not you're actually listening. Much like Mr. Uninspired, the Yakker is often confused with two closely related species: the Pulldown Pick-Up Artist (trolling for dates, one awkward, sweaty introduction at a time) and the Social Network-Outer (the health club is his "Cheers," and he's Norm Peterson). The difference? Although the latter two are concerned with others, Yakkers are concerned only with themselves. Their lives are just that interesting! How else to explain someone who pays a trainer $60-plus per hour to hear a bottle-by-shot-glass account of each and every drink he or she downed Friday? Or is willing and eager to render not only their workout but also the routine of their partner utterly worthless because if you can giggle and converse coherently while supposedly running a 45-minute hill course, it means YOU MIGHT WANT TO TRY SOMETHING HARDER THAN LEVEL 2.
Who else brings their smartphone to the exercise floor -- for non-musical voice and text use -- just in case no one feels like talking to them? Also akin to Mr. Uninspired, the Yakker can sap your will to exert yourself through sheer force of bad example; in certain creationist theological circles, Yakkers are believed to be the reason God invented MP3 players with volume controls. Signature behavior: A permanent state of being blithely unaware that although it isn't polite to stare, it's even less polite to stare at your own reflection with the locked-in focus of a jeweler, the better to determine whether six weeks of single-legged lunges have added an ecstasy-inducing three millimeters of lift to one's buttocks or merely a clinical-depression-inducing two. Distinctive markings: Hey, whatever they are, the Mirror Maid will know them way better than you ever will. Natural enemies: Objects positioned between a light source and a reflective surface; brushed metal elevator doors that are just reflective enough to make someone look fat; malfunctioning tanning booths. First things first: The Mirror Maid can be a man. Gender isn't relevant. What matters is sheer narcissism. On the inside, Mirror Maids ride a fearsome psychological roller coaster between the ebullient high of feeling like the fairest one of all -- look at the cut on my triceps! -- and the terrible, gnawing emptiness of suspecting otherwise. On the outside, they mostly spend a lot of time looking at themselves. Loading up for a heavy squat? Need to see yourself in the mirror to avoid, you know, slipping a disc? Be forewarned: Just as you're about to lift, a Mirror Maid will invariably set up shop directly in front of you, exercise band in hand. Enjoy the view. They'll be doing the same. Signature behavior: Loudly reminding the world that although reps No. 7-10 on the leg extension machine were not included in the original Labors of Hercules, they probably should have been. Distinctive markings: Bulging forehead veins; gritted teeth; budding hernia. Natural enemies: Gyms that ban grunting. • A quick, explosive, surprised-sounding grunt, followed by relieved exhaling: Holy [expletive], this is heavy! • Regular, rhythmic grunts, not quite as loud as the Robert Tepper song leaking from the Grunter's earbuds: C'mon, stallion, one more set. • Taut, focused, machine-gun grunts, same volume as the Danzig tune blaring from the Grunter's earbuds: If my cheapo employee health plan covered gym memberships -- or anger management therapy -- maybe I wouldn't hate my job so much. 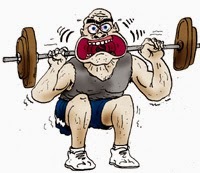 • Eye-bulging grunt/scream, followed by throwing giant, weight-loaded Olympic bar to floor: The Winstrol is kicking in. • The above, bookended by a soft whimper: The Winstrol is wearing off. • Grunt takes place in lowest point of squat, accompanied by wrinkled nose: I hope no one heard that fart I just ripped. • Nonsensical, multisyllabic grunt delivered in Austrian accent: What is best in life is to crush your enemies, to see them driven before you and to hear the lamentations of their women. • Nonsensical, multisyllabic grunt delivered sans Austrian accent: I just tore a pectoral muscle. Signature behavior: Providing health and fitness instruction to clients via borderline sexual harassment real-time biofeedback. Distinctive markings: None, but hands are surprisingly warm and nimble. Natural enemies: Female gym-goers who have seen his tired act before; the same people who are currently upset with the TSA. Mating call: "Wait. Stop. Bend at your waist. Like this." The Hands-On Trainer is exactly that: hands on. Like, on your hips. Your stomach. Your shoulders. Your chest. The small of your back. Inevitably, your glutes. You know those Show Me Where He Touched You dolls used in child protective services cases? That doll is pretty much you. Only this is for your own good. You want to get fit, right? Shed those holiday pounds? Trust the Hands-On Trainer. He knows what he's doing. He's a pro! Relax, already. Good. This is one of his favorite stretches. Touch your knee to your forehead. Keep breathing. Ha ha. This is a little embarrassing for him, too! Feel loose? Great. Today, you're going to do some straight-legged deadlifts. Followed by squats. Don't worry. He'll be there to guide you through the motion. In case you drop too low. Like … right there! Feel that? That's too far. Good squeeze, though. Very good. One more time? Excellent. Oh, sure. Of course you'll firm it up. That's why you hired him, right? Signature behavior: Making a mockery of human biomechanics; performing lifts of superheroic size-to-weight proportions despite not having been bitten by a radioactive spider. Distinctive markings: Facial expressions convey earnestness, cluelessness. Natural enemies: Anyone with the gall to gently point out that one shouldn't be able to fit a 20-pound frozen turkey between the bench and the curved small of one's back while doing bench presses; health insurance adjusters. Mating call: "It's just a slight twinge. Nothing to worry about." A tragic figure, the Future Chiropractic Patient is less a victim of gravity and basic physics than his own pathological competitiveness. If he sees you lifting 50 pounds, he'll immediately hoist 80; if you're running at level 10, he takes it to 11. In a sense, this is admirable: His heart is pure. He tries hard. Gives everything he has. Problem is, he has no idea what he's doing. He views exercise the way unintentional overdose victims view prescription medication: If one pill is good, 10 must be better! Blessed with the physique of an NFL front-office statistician, the Future Chiropractic Patient overloads every bar and machine with the zeal of an NFL combine participant, throwing himself into full-body biceps curls, leaping squats and probable traction. Oh, and if you can't spot the Future Chiropractic Patient at your gym, bad news: It's probably you. • The Space Invader: Exercise class attendee who inadvertently elbows you, fails to realize this isn't the Tokyo subway. • The Hoarder: Underfoot collection of every dumbbell from 20 to 50 pounds would be more impressive if you didn't need to use them, too. 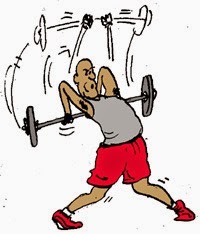 • The Circuit Jerk: Like the Camper, but ties up three machines instead of one, moving to and fro. Hey, I'm still working on that! Didn't you see my towel? • The Cheapskate: Won't spring for a personal trainer; won't stop bugging you for fitness tips. • The Wannabe MMA Guy: Shaved head, sweatshirt, spends 50 minutes elbow-striking and shin-kicking the heavy bag. • The Guy/Gal Who Only Looks Like Someone Famous: You mean that isn't George Clooney? • The Halley's Comet: The celestially hot girl (or guy) you see once but never again, no matter when or how often you return to the gym. • The Gym Fashion Plate: Wears expensive, coordinated exercise outfits from a brand you've never heard of, but will be super-popular among moms pushing strollers a year from now. • The Throwback: The guy who still uses the StairMaster. Religiously. • The Earbud DJ: You can hear his music over yours … and you're wearing earbuds, too. • The Meathead: Looks scary and 'roid-ragey but is actually the single nicest and most helpful person at the gym because, unlike everyone else, he's genuinely happy to be there.